Can someone PLEASE explain to me why I often do this, PLEASE! This weekend I went to Edmonton for a friend's birthday and to get some fabric and sewing supplies. I was looking at the wall of sewing tools at the fabric store, saw a tailor's awl and thought to myself, "Hey I don't have a tailor's awl and I really need it!" 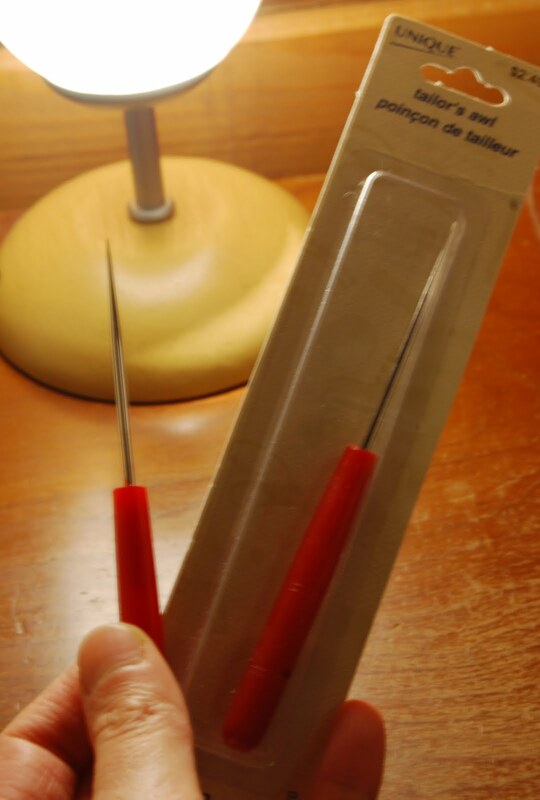 Bought it, came home and, lo and behold, I already had a tailor's awl in my sewing tool box. Yee-haw! Ugh! And guess what?! What I really needed was a new pencil sharpener and AA batteries for my computer mouse which of course I completely forgot. In the meantime please excuse the really blurry photo above and the extreme boringness of my blog. I'm still in the middle of sewing a madness a sewing madness. I'm creating and making some jig(gigue) costumes for a group of young girls. It's just taking much longer then I thought. Almost there! Do it all the time,you're not alone! In the meantime, what do you use a tailor's awl for? LOL. I'm constantly picking up things that I THINK I need.... and end up coming home and realizing not only did I already possess that item... I am completely out of something essential. Like... toilet paper perhaps..